The flag of Puerto Rico consists of five horizontal bands of red and white, with a blue triangle containing a white start on the hoist-side. Although there are official color shades for the flag, variations are used in practice - pro-independence supporters favor light blue, and pro-commonwealth and pro-statehood supporters favor dark blue as used on the flag of the United States. The flag was originally designed by Francisco Gonzalo Marin in 1892 to symbolize the ideas of the Puerto Rican independence movement (at a time when Puerto Rico was still a Spanish colony). 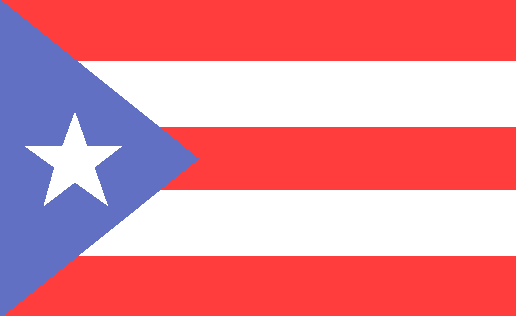 The three red stripes represent the blood of brave warriors, the two white stripes represent the peace that would be gained by independence, the triangle represents the three branches of government, the blue represents the sky and the coastal waters, and the white star represents the island of Puerto Rico. In 1898, following the Spanish-American war, Puerto Rico was occupied by the United States and became a United States territory. It was infact illegal for more than half a century to fly the Puerto Rican flag on the island. In 1947, the United States Congress approved legislation allowing Puerto Rico to elect its own Governor. Luis Munoz Marin was the firt elected Governor in 1949, and in 1952 the new administration proclaimed the Marin flag the official flag of Puerto Rico.